10 years ago, who knew that the humble kitchen of Hubli that was providing mid-day meals to 4,000 children will grow to become a mega kitchen? The Akshaya Patra Foundation, an Indian Charitable Trust, has been implementing the mid-day meal programme since 2000. The charity’s Hubli kitchen was established in 2004 and was one of the first kitchens of the Foundation. Initially, it was serving mid-day meals to 4,000 children and gradually the kitchen was providing for 80,000 children. Working in partnership, the Government of Karnataka allotted a bigger plot in the outskirts of Hubli to cater to the increasing number of beneficiaries. The new facility is equipped with advanced technological mechanisms and has become the first mega and model kitchen of this Indian Charitable Trust. This kitchen is an example of the joint effort of professional architects, devotees and engineering students. The Hubli kitchen is an ISO 22000:2005 certified centralised facility. Currently the Hubli kitchen provides mid-day meals to over 126,000 children every day covering around 789 Government schools. The Akshaya Patra Blog titled Hubli Kitchen: From Traditional to Contemporary will give you a detailed account of this Indian Charitable Trust’s kitchen. The Akshaya Patra Foundation is launching an online campaign?Feed by ‘Like’ on 11th November, 2014. 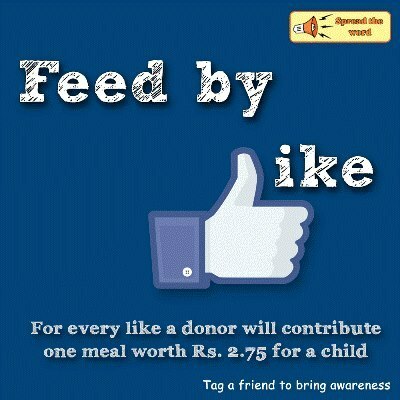 When one likes Akshaya Patra’s Facebook page, a donor contributes a meal to a child. With all the fans participating, it is quite a lot of meals for children hungry in school. That is the idea of the impact this campaign should have. This campaign aims to increase its Facebook reach further by increasing fan base. Besides increasing the fan base of Facebook, the campaign?Feed by ‘Like‘ should also increase lead generation and brand awareness through Facebook and all the other online channels implemented. Getting support through sponsors and increase interaction and engagement are also the prospective outcomes. The Akshaya Patra Foundation is a not-for-profit organisation that implements mid-day meal programme in over 10,000 Government and Government aided school across India. The kitchens of Akshaya Patra are spread over 23 locations across 10 States in India, reaching 1.4 million children with a hearty meal every school day. The organisation works in public-private partnership with the Government of India and several State Governments in the country. The organisation aims to reach 5 million children by 2020 and is continuously working to accomplish it. When one surfs the internet he finds a number of charitable trusts in India alone. Of the many trusts some are involved in providing mid-day meal in India. The Akshaya Patra Foundation is a charitable trust in India implementing the mid-day meal programme. This charitable trust in India has been functional since June 2000. In its journey of 14 years, it has served mid-day meal to 1.4 million children across more than 10, 600 Government schools in India. Akshaya Patra is present in 23 locations across states of Karnataka, Andhra Pradesh, Odisha, Assam, Gujarat, Rajasthan, Chhattisgarh, Uttar Pradesh, Tamil Nadu and Telangana. Everyone has their own reason to donate to charity in India or elsewhere. The reasons mainly depend upon the individual’s interest and potential of a particular cause. Over time, NGOs have evolved many innovative ideas of fundraising. Fundraise with us and Fundraising ideas are two sections of Akshaya Patra that will provide a list of interesting activities that can be done to raise donations while creating awareness about the cause. In present times, one can choose either offline or online medium to donate to charity in India. Apart from choosing to donate to charity in India, one can also choose to contribute to the mid-day meal programme in India through their time and skill, i.e. through volunteering. Get involved will provide various volunteering options to choose from for the benefit of the children. Read millions of heart warming tales of the young beneficiaries at Stories of hope. Their stories may be different but what’s common is the determination to achieve their dreams. How many of us in Karnataka have marked out November 1st on our holiday calendar, planning getaways and lazy breakfasts, secure in the knowledge that it’s a public holiday? We know what it is – It’s Kannada Rajyotsava! – And we know when it is, but do we know what it signifies? Here’s a quick look at what Kannada Rajyotsava is all about. November 1st is Kannada Rajyotsava, the day that the state of Karnataka was formed. On this day, in 1956 all the Kannada speaking areas of South India were merged into a new state. The state was initially called Mysore, but this was considered too reminiscent of the old princely regiment, and the name was changed to Karnataka on 1st November, 1973. Kannada Rajyotsava is celebrated very enthusiastically all over the state. The state is dotted with Red and Yellow as the Karnataka flag is hoisted at important locations, and the state anthem is sung. The beauty of this day is that it is enjoyed with as much excitement across age groups, religion, gender and income, making it a truly wholesome and inclusive celebration. Local citizens also get to honour the good samaritans of society as the State Government bestows the Rajyotsava awards on people who have contributed in a noteworthy way to the development of the state. Kannada Rajyotsava is really a day to pay tribute to the state of Karnataka, celebrate its progress and work to its continued development. This can be done in many ways according to your individual capabilities. For The Akshaya Patra Foundation it was by providing a means to solve classroom hunger in the state. Today, across six kitchens in the state (at H.K. Hill Bangalore; Vasanthapura, Bangalore; Bellary; Hubli; Mangalore and Mysore) we reach out to 463,682 children in 2,629 Government and Government-aided schools every day. While we supply food for education to these children from our highly specialised, centralised kitchens, we know there are thousands more in need of our help. But we wouldn’t have made it this far in Karnataka without the support of our donors and corporates, but most importantly the Government of Karnataka. For us Kannada Rajyotsava is not just a public holiday, it’s a time to honour this state, the birthplace of our Foundation. va, the day that the state of Karnataka was formed. On this day, in 1956 all the Kannada speaking areas of South India were merged into a new state. The state was initially called Mysore, but this was considered too reminiscent of the old princely regiment, and the name was changed to Karnataka on 1st November, 1973.
g areas of South India were merged into a new state. The state was initially called Mysore, but this was considered too reminiscent of the old princely regiment, and the name was changed to Karnataka on 1st November, 1973.
this day is that it is enjoyed with as much excitement across age groups, religion, gender and income, making it a truly wholesome and inclusive celebration.